Summer has really made its presence felt here in the Philippines. So spending an afternoon cooped up in my room with a temperature of 34 degrees Celsius is not my idea of a holiday! The worst part of it all is that my body is craving for some caffeine. Sipping freshly brewed coffee in this heat is so not appealing. Drinking an iced coffee blended drink would be just perfect--if only I wasn't dieting! Being a Starbucks Frappuccino fan, I was shocked and disappointed when my brother broke to me the news that drinking a Venti-sized Dark Mocha Frappe (my current favorite) is equivalent to the ideal number of calories alloted for a person for one meal. Not only that, a venti sized drink here is also quite pricey. 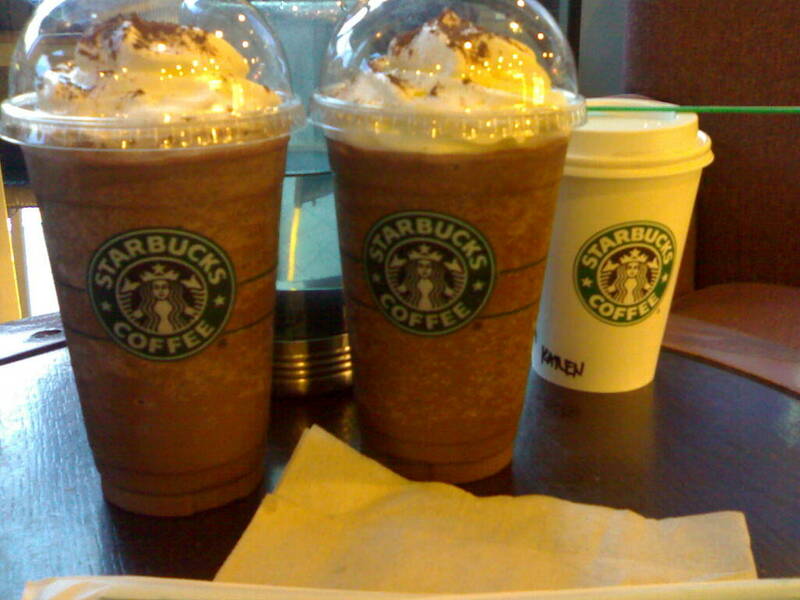 PLUS I have to haul myself to a mall or a nearest Starbucks store to get my drink. Which I'm not that keen on doing because I don't want to commute. So as a solution I decided to opt for a less calorie, cheaper, iced-coffee drink which I made by myself which I'd like to share with the rest of you! A. IF you want to drink it NOW, first make sure to make your drink a bit more stronger than usual. Then pour your coffee drink in a plastic tumbler with lots of ice. Like A WHOLE LOT OF ICE. And then shake shake shake until you're satisfied with its icy frothiness!!! IF you have a blender, the better! Coz then all you have to do is blend the ice and coffee drink until you reach the right consistency. B. For those who don't have a blender and is willing to wait, pour your coffee drink in a clear or transparent plastic. You know, the one that is used in making or storing ice in the freezer? AND YES, you are supposed to freeze it. This drink takes time because you have to wait for it to be a bit solid as if it has an outer shell of ice with the inside still liquid. When it has reached that point, you can now enjoy your drink by breaking the plastic and putting everything in your favorite tumbler. You can shake it too if you want to have a bubbly or frothy look. And FINALLY, the moment you have been waiting for--go ahead and take a gulp of your delicious iced coffee! Its cheaper (because you already have it at home! ), less fattening (no whip cream! ), and yes it will satisfy the coffeeholic in you coz it surely satisfied me. Social Networking Craze - a fad that stuck!